"This is a yummy recipe that any cheese or casserole lover will adore! It's super easy to make, as most casseroles are. It's also a fun recipe to play around with; you could add vegetables (broccoli might be nice) or bacon. Just have fun with it!" Season chicken breasts with salt and pepper. Heat a large skillet over medium heat; pan-fry chicken until no longer pink in the center, about 10 minutes per side. Shred chicken. Spread chicken over crescent roll triangles. Roll triangles, starting with the wider end, around chicken. Arrange rolls on prepared baking dish with the seam sides down. Place rolls into prepared baking dish. Mix cream of mushroom soup, cream of chicken soup, milk, and Cheddar cheese in a bowl; pour mixture over crescent rolls. Bake in preheated oven until bubbly and rolls are golden brown, about 40 minutes. YUM!! Will definitely make this again. I bought a pre-roasted chicken to save time and added a cup of frozen broccoli florets as suggested and it was just perfect! 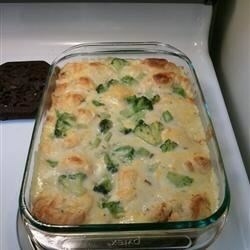 This was a big hit in my house, I added broccoli as well, and cheese on top, and my family is already asking for it again!